Q: When was your passion for music born? Your passion for singing? A: My passion for music began as spontaneously as possible, in an original way. I was about 7 years old when the local parish of my home town Tavullia organized a music course. All the children of the village between the ages of 6 and 10 years old were invited to participate, and each of us was given a musical instrument made of plastic that resembling the original instrument in no other way than generic appearance. I was given a saxophone. The sound of each of the instruments was more or less the same, but the purpose of the initiative was not so much to learn how to play a specific instrument but rather, to teach us the basics of music – notation, a sense of rhythm, how to play in public. The idea was to develop an increased interest in music both for us and our families. Although the initiative only lasted about a year, my uncle Gianni, well-aware of what we were doing with plastic instruments, decided to give me his “real” accordion, which he had not used for a long time. From that day on, my entire world revolved around that instrument. I played it every day, listening to my favourite songs on the radio and trying to reproduce them on the accordion. Sometimes when I heard themes on TV, I immediately went to play them. My parents responded to my enthusiasm by deciding to enrol me in the “Gioachino Rossini State Conservatory of Music“ in Pesaro when I was 11 years old – first in the saxophone class, then in the double bass class. My passion for singing was born about ten years later. I had recently finished my diploma on the double bass (1986), and I was still studying composition because, a few years earlier, during the three years of the study of solfeggio, I decided to become a conductor. At a certain point I realized that a good conductor must be well-acquainted with the characteristics of all of the instruments in the orchestra, including the techniques utilized in lyrical singing. At about the same time, a number of people at the music conservatory, noticing the nature of my speaking voice, suggested that I take up the serious study of singing. After a number of attempts with singing teachers in the conservatory, I decided it was time to contact someone with much more experience. In the summer 1987, when Luciano Pavarotti was vacationing for a few days in Pesaro at his villa by the sea, I madly contacted him and asked if he would listen to me and deliver a judgement on my vocal potential. He told me to meet him at the villa in two hours. Within minutes of my arrival, he cordially welcomed me to the villa and asked me which aria I wanted to sing. Since I didn’t know any, he made me vocalize in an effort to ascertain the extent and quality of my voice, and after 5 minutes of vocalizations he declared: “If you do not study singing, you’re crazy!” Rather than happy though, I was confused. I had dreamed of becoming conductor, playing the double bass, the accordion, the bandoneon, the piano, the organ, and now out of the blue, I was faced with the idea that I might have a particular predisposition for singing – and that on the advice of Luciano Pavarotti himself. Nonetheless, I decided to put the study of singing on hold to finish my courses on composition and conducting. In 1990 I left Pesaro and moved to Vienna. Though I had moved to Vienna to refine my orchestral conducting skills in an effort to begin my career as a conductor, I decided to take singing lessons with Kammersänger Hilde Zadek. Each morning, from Monday to Friday, I studied German at the Goethe Institut and each afternoon I took 30 minutes of singing lessons with Zadek. I continued like that for 2 years until Tamar Rachum, the director of the vocal department of The Buchmann-Mehta School of Music in Tel Aviv came to visit. Upon hearing me during a lesson, she asked if I was interested in going to Tel Aviv to debut the role of Don Giovanni. I wanted to be a conductor not a singer, but the idea peaked my curiosity, and I decided to try one production on the stage, after which I would return to Vienna and continue my dream of orchestral conducting. So I went to Tel Aviv in January of 1993, and in April I debuted in the role of Don Giovanni. It went exceptionally well – so well that I was offered the opportunity to remain at the Buchmann-Mehta School of Music as a guest student taking part in other productions and concerts, and studying new roles day after day. I spent a year in Tel Aviv, until the St. Gallen Theater in Switzerland asked me to audition for them. I went, and they immediately offered me a spot in the ensemble for roles like Don Giovanni, Belcore (Elisir d’amore), Harlekin (Ariadne auf Naxos), etc. After few months at St. Gallen I auditioned for the Vienna State Opera, and the Opera Director, Ioan Holender, offered me a place in the ensemble there. My debut in the prestigious Viennese theatre took place on September 27, 1995 with the role of Sharpless (Madama Butterfly); that date marks the beginning of my international career as a baritone. Q: You were determined. You took your dream and turned it into reality… what advice might you give to someone who wants to have a career in the world of the theater? A: It seems to me that starting a career today is much more difficult than it was 30 years ago. It is one thing to have a dream quietly hidden away in a drawer, it is another to take it out and make it come true at whatever cost. Doing so requires a lot of determination, looking forward without turning back, and studying, studying, studying. I think that the fact that we find ourselves constantly immersed in the online world has not changed the fundamental requirements necessary for a young singer who dreams of entering into the world of opera. Talent alone has never been enough and it certainly isn’t today. It is essential to be committed to the meticulous study of the vocal score and the full score, to have a solid musical base, to know as many foreign languages as possible, and to be reasonably well-cultured – all of which are fundamentals necessary before one can even beginning to hope for a career in the world of lyrical theatre. Q: You have lived in Vienna for 30 years – a culture different from ours [in Italy]. Has your way of perceiving music changed? How does your way of experiencing music and your outlook on life, differ from that of your Italian colleagues and musicians? Is there a difference? A: Honestly, the dream that brought me to Vienna was to live in the city where almost all the greatest artists throughout history lived. There isn’t a street, a park, or a district in Vienna that doesn’t bear a commemorative plaque of some composer, opera singer, conductor, or any number of actors and directors. I couldn’t say right now if my way of perceiving music changed as a result of my move to Vienna in 1990, but I can certainly say that I have changed immensely, in my integrity. I have broadened my horizons. In those years, I lived in daily contact with some of the greatest conductors and singers in the world and because of that, I quickly developed the goal of taking the stage of the Vienna State Opera and the concert hall of the Musikverein. After 3-5 years, I attained those goals. In 1993, I sang in the Goldene Saal of the Musikverein under Nikolaus Harnoncourt, and a couple of years later I debuted at the Vienna State Opera in Madama Butterfly. For me, living a life of music in Vienna is an existential necessity. Even today, though there are no more conductors like as H. von Karajan, L. Bernstein, C. Kleiber, C. M. Giulini, C. Abbado, and L. Maazel, the period from September to June offers me the opportunity to hear the greatest artists and best orchestras in the world (the Vienna Philharmonic in the first place). I sense a profound need to embrace this reality – a need which, over the years, has not only not diminished, but increased. Q: You have performed in the theaters of Naples, Palermo, Genoa, Turin, Bologna, Florence, Venice, Cagliari, Trieste, Verona, Parma, Reggio Emilia, Catania, Ancona, Bergamo. And more: Hamburg, Brussels, Amsterdam, Berlin, Basel, Bern, Wexford, Palm Beach, Tel Aviv, Tokyo, Zurich, Aix-en-Provence Festival, Salzburg Festival, Wiener Festwochen. You have interpreted a variety of works and characters. What is the one work and character that you feel most attached to and why? A: Guillaume Tell by Gioachino Rossini in the title role. Sometimes I jokingly wonder if Gioachino Rossini looked down on me from on high when I crossed the threshold of the Pesaro Conservatory of Music (which he himself bequeathed) and started my musical studies in 1976. Did he already know that one day I would sing the title role of his Guillaume Tell? My intimate connection with opera is a direct result of Rossini’s works. The first opera I ever heard was La Gazza Ladra in 1981 at the Teatro Rossini during the first Rossini Opera Festival. From 1981 to 1990, as a young and promising conductor, I spent all my summers at the R.O.F. watching rehearsals and performances of Rossini’s operas – many of which had never been heard before and been performed in full version with adequate attention to the smallest of details. 30 years have passed since then. In that time, I have become a baritone, and in autumn 2015 I was offered the opportunity to prepare the role of Guillaume Tell for the upcoming season at the Metropolitan Opera in New York. I have found Guillaume Tell to be a work of incomparable completeness, grandeur and compositional perfection, both as a singer and as a conductor. The role of Guillaume Tell it is a role for life, and every time I sing it I am brought back to that very first moment when I walked through the door of the Rossini Conservatory so many years ago and where it all began. Thank you Maestro G. Rossini! Er kommt bei Presse und Publikum gleichermaßen gut an – der wandlungsfähige junge Bariton Davide Damiani. Er besticht einmal als gefährlich erotischer Almaviva in Mozarts „Le Nozze di Figaro“, dann als imponierender Graf von Toulouse („Jérusalem“ ), als animalischer Don Giovanni oder als ausdrucksvoller Ford. Der italienische Bariton startete seine Karriere als Don Giovanni in Tel Aviv und war schon bald gefragter Gast an den verschiedensten internationalen Opernhäusern wie Neapel, Palermo, Berlin, Toronto oder dem Wexford Opera Festival. Sie haben sich der Musikwelt von den verschiedensten Richtungen genähert – zunächst Kontrabass, dann auch noch Komposition und Dirigieren studiert. Wann fiel die Entscheidung, sich doch auf den Gesang zu konzentrieren? Die Entscheidung, doch zu singen, kam erst, als ich alle drei anderen Studien abgeschlossen hatte, denn Singen habe ich eigentlich nur gelernt, weil ich dachte, es könne mir beim Dirigieren helfen – helfen, Sänger besser zu verstehen und zu unterstüzen. Als ich aber dann in Wien bei Hilde Zadek begonnen habe, Gesang zu studieren, wurde er immer wichtiger für mich. Nach und nach hat sich mein Interesse in diese Richtung verlagert, bis es nur noch eine Frage der Zeit war, dass die Bühne siegen würde. Wie kommt man von Pesaro nach Wien zu Hilde Zadek? Gab es in Italien, dem Land der Musik, keine Lehrer nach Ihrem Geschmack? Ganz so krass würde ich das nicht ausdrücken, denn ich hatte immer schon vorgehabt, irgendwann einmal in Wien zu studieren. Für mich war und ist das die Stadt der Musik. Da atmet jedes Gebäude Geschichte, und so habe ich mich einfach schlau gemacht, wie und wo ich am besten meine Studien fortsetzen könnte, und an der dortigen Akademie Dirigieren studiert. Mein damaliger Lehrer hat eines Tages zu mir gesagt „Wenn du wirklich ernsthaft Singen lernen willst, dann weiß ich nur eine Lehrerin für dich: Hilde Zadek. Sie ist die beste“. Und so habe ich mich ihr vorgestellt. Sie hat mich angenommen, und mein Dirigierlehrer hat recht gehalten. Nach zwei Jahren mit Hilde Zadek war ich bereit, meine erste Oper zu singen: „Don Giovanni“, und bald darauf kam der Graf in Mozarts „Nozze“ dazu. Das war aber ein ganz besonderer Glücksfall, denn es gibt nicht viele Sänger, die auf Anhieb das Glück hatten, einen guten Gesangslehrer zu finden. Das ist wahr. Hilde Zadek ist eine ganz außergewöhnliche Persönlichkeit. Sie kehrt nie die große Lehrerin hervor, die sie ja zweifellos ist, motiviert ihre Schüler durch ihre unglaubliche Energie, mit der sie an die Arbeit geht. Auch ich habe das gespürt und mich davon anstecken lassen. Sie wiederum war immer ganz erstaunt gewesen, dass ein Italiener nach Wien gekommen war, um hier italienisches Repertoire zu studieren. Normalerweise ist es eher umgekehrt. Aber der Erfolg gab mir recht, und für mich war meine Studienzeit in Wien eine der schönsten meines bisherigen Lebens. Ihre Debüts haben Sie aber in Israel absolviert. 1993 ging ich nach Israel, habe dort bei Tamar Rachum, einer Schülerin von Hilde Zadek, studiert und meine ersten Schritte auf einer Opernbühne gemacht. Danach hatte ich mein erstes richtiges Engagement am Stadtstheater von St. Gallen. Viele Karrieren haben in Israel begonnen. Das muss ein fruchtbarer Boden für junge Künstler sein. Das ist wahr. In Israel fühlen sich junge Sänger geliebt und gefördert. Und indem viele ausländische Musikstudenten ins Land kommen, wird auch den dortigen Studenten, die oft unter den schwierigsten Bedingungen arbeiten, ein Blick über die Grenzen gewährt. Das tut denen auch gut, denn so werden sie mit den verschiedensten Mentalitäten, Stilrichtungen und Schulen konfrontiert, ohne selbst außer Landes reisen zu müssen, was sich die meisten ja nicht leisten können. Dass dieses Konzept aufzugehen scheint, sieht man daran, dass in den letzten Jahren immer mehr israelische Sänger nach Abschluss ihrer Ausbildung nach Europa kommen und hier Karriere machen. Ich muss heute wirklich sagen, dass diese Zeit in Israel der Grundstock meiner Karriere gewesen ist. Dort habe ich zum Beispiel den Giovanni erarbeitet, den ich später so oft singen sollte. Der Giovanni ist nicht die übliche Anfängerpartie. Auch danach haben Sie eigentlich immer gleich große Partien gesungen. -beispielsweise sofort Verdi zu singen. Das hätte meiner Stimme zu Beginn sicherlich geschadet. Ich hingegen habe mit Mozart begonnen und bin lange bei diesem Repertoire geblieben, denn ich habe genau gespürt, dass es mich vorangebracht hat. Hätte ich mit Verdi begonnen, wäre ich heute schon bei Wagner gelandet und wahrscheinlich bereits stimmlos. Ich habe mich in kleinen Etappen ganz vorsichtig von Rolle zu Rolle vorgearbeitet und kann heute sagen, dass mir der Erfolg recht gibt.Jeder Sänger muss da seinen eigenen Weg gehen. Der eine beginnt mit Verdi und überlebt es. Von den vielen, die dabei auf der Strecke bleiben, hört man ja nichts mehr. Sie gehen als unbekannte Opfer unter. Mir hat ein sehr kluger Mann zu Beginn meiner Karriere einmal gesagt, dass es nicht darauf ankommt, wo und womit man seine Karriere beginnt, aber wo und womit man sie beendet. Genau. Ich bin sehr glücklich, dass ich meine erste Erfahrungen in Ruhe in Israel gemacht habe. Nach diesem Jahr war ich dann schon bereit für Europa und habe in St. Gallen Partien wie Giovanni, Harlekin oder Belcore gemacht. 1995 wurde ich dann schließlich an die Wiener Staatsoper engagiert und habe dort 24 Partien gesungen, so in „Jérusalem“, „Oedipe“, „Le Prophete“. Ihr Werdegang hört sich so leicht an. Es ging ganz selbstverständlich voran. War es wirklich so? Es war nicht so einfach, wie es sich jetzt anhört. Wenn man jung ist und den ersten Erfolg gehabt hat, dann wollen einen alle plötzlich ausprobieren und bieten einem alles Mögliche an. Zu diesem Zeitpunkt ist es relativ einfach, an den Häusern zu debütieren. Giovanni wollten sie mich beispielsweise für eine Belcantorolle, dann für Verdi. In dieser Phase läuft man Gefahr verheizt zu werden. Da muss man dann die Stärke haben, Nein zu sagen. Ja, denn Karriere macht man mit dem Wörtchen Nein. Man muss für sich selbst immer entscheiden, wann der richtige Moment für eine bestimmte Sache ist, und darf nicht zu enthusiastisch werden und zu allem Ja sagen. Oder Angst davor haben, dass einem jetzt die Chance seines Lebens entgeht, wenn man einmal Nein gesagt hat. In Wexford zum Beispiel habe ich in 16 Tage 12 Vorstellungen gesungen. „Rigoletto“ und „Il Giuramento“ von Mercadante und noch einen Liederabend. Das war physisch wie psychisch eine mörderische Sache, aber es war auch eine interessante Erfahrung zu sehen, dass ich auch solch extreme Bedingungen durchzustehen imstande bin. Sie haben schon mit vielen großen Dirigenten gearbeitet. Gibt es eine Persönlichkeit, die Sie beeinflusst oder geprägt hat? Ich glaube, dass es zu Zeiten Toscaninis leichter gewesen ist, auf junge Sänger Einfluss zu nehmen. Damals hat man Wochen, Monate, ja Jahre miteinander gearbeitet. Die Dirigenten haben die Sänger wirklich kennengelernt und umgekehrt. Heute erlaubt sich ein Dirigent eigentlich nur selten, einem Sänger etwas Grundsätzliches, über die Probenarbeit Hinausgehendes zu sagen. Schon gar nicht gesangstechnisch, denn wenn der Sänger eine Bemerkung missversteht und auf den falschen technischen Weg kommt, sind er, der Dirigent, und die ganze Produktion in Schwierigkeiten, und das will niemand riskieren. Eigentlich muss man alle Tricks und Kniffe für sich selbst entdecken. Wer mich aber stimuliert und sehr beeindruckt hat, war Maestro Anton Guadagno. Mit him habe ich sehr gerne gearbeitet. 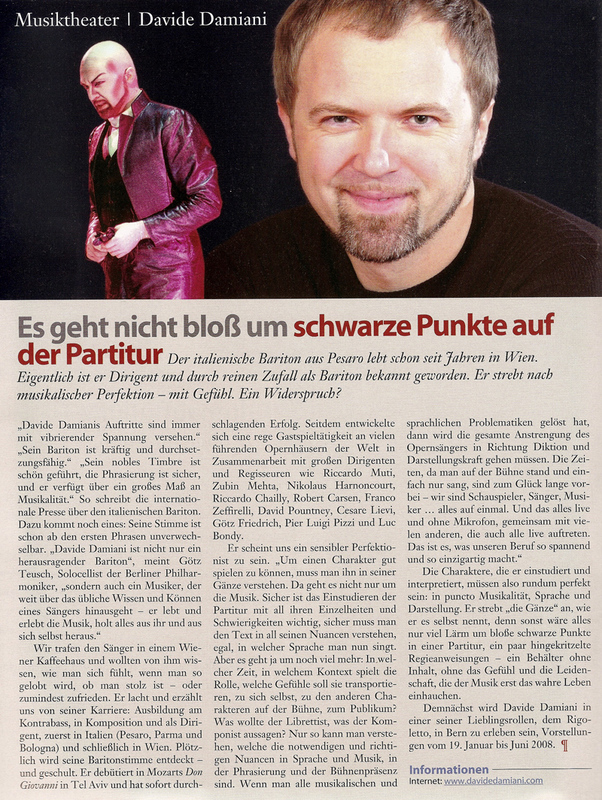 Zuletzt sollte „Don Giovanni“ in Palm Beach auf unserem Programm stehen, aber davor ist der Maestro leider verstorben. Als ich von seinem Tod gehört habe, habe ich mich ganz leer gefühlt und wollte gar nicht daran denken, wer die Produktion nun übernehmen würde. Für mich war er noch ein Dirigent vom alten Schlag, durch und durch ein Handwerker, der mit Leib und Seele Dirigent war und die Sänger geliebt hat. Wir haben zusammen „Butterfly“ gemacht, und er hat mir die Türe zu einer Welt geöffnet, in die ich vorher noch nicht geschaut hatte. Eine großartige, edle Welt, in der ich sehr viel für die Zukunft gelernt habe. Was ist im Moment Ihr bevorzugtes Repertoire? Mozart wird mich niemals loslassen. Er tut der Stimme gut und auch der Seele. Speziell der Giovanni erinnert einen immer wieder daran, nicht nur Sänger zu sein, sondern überhaupt Musiker und vor allem Schauspieler. So suche ich im Moment überhaupt Rollen, mit denen ich etwas ausdrücken kann. Das ist dann mehr als bloß singen, das gibt mir Befriedigung. Das Idealste ist, wenn man im Laufe einer Partie vergisst, daran zu denken, wie schwierig sie ist und wann die ein oder andere kritische Phrase auf einen zukommt. Man konzentriert sich auf die Partie insgesamt-vokal wie darstellerisch. Ebenso will ich nicht daran denken müssen, welche Rolle in meinem Repertoire nun schwieriger ist als die andere. Nach dem Motto: Was ist jetzt schwieriger? Don Giovanni oder Jago? Erstens muss das jeder für sich entscheiden, zweitens hängt das auch von der momentanen Verfassung ab, und drittens suche ich generell interessante Rollen, die ich jeden Abend aufs Neue erobern muss. Gelingt das und steht man als Sänger voll dahinter, merkt das auch das Publikum. Dann springt der sogenannte Funke über. Kommen neue Partien auf Sie zu? Der Balstrode in „Peter Grimes“ in Graz in der Regie von Stephen Lawless; Philippe Jordan leitet die Produktion. Dann kommt Jago; wir sprechen auch über Dr. Faust von Busoni, Escamillo, und dann sehen wir weiter. Ich würde auch sehr gerne wieder einmal einen Rigoletto singen, denn die Erfahrung von Wexford hat mich sehr beflügelt. Ich habe da auch sehr an der Rolle gearbeitet und viel Neues entdeckt, und das würde ich jetzt gerne weiterführen.